BEHOLD! The Museum! Current exhibits on display include: The Mummy King! The kids arrive at the Museum today, and learn a little about The Mummy King – an ancient ruler who conquered most of the known world. We deviate from the real world a little bit here, since there wasn’t really a Mummy King – however, it’s not completely removed from reality. There are conquerers who did take over most of the known world at the time of their rule. 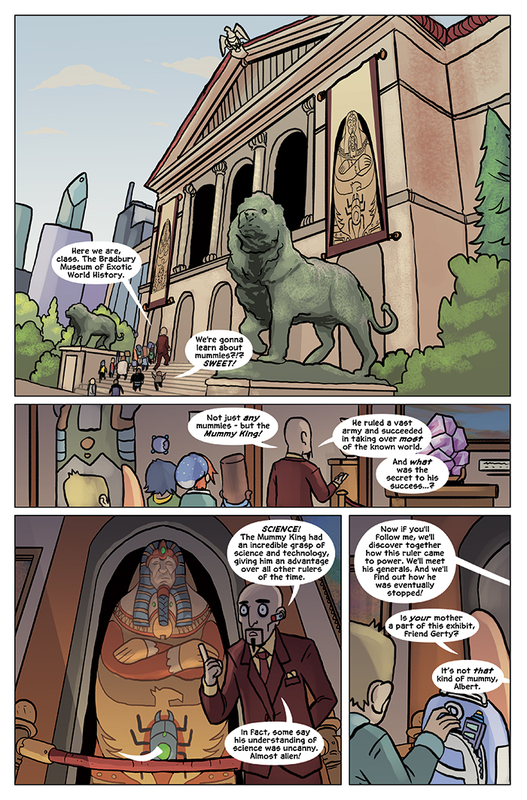 We wanted to do something like that here, but more comedic (and awesome, because mummies are awesome). We also get to see the outside of the museum building, which is modeled after the Chicago Art Institute – my wife’s favorite building in the whole city, and her favorite museum. I love the way this building looks as well. With Albert, I’m always encouraging Gabe to combine the old school / classic design of buildings and juxtapose it with the modern / futuristic technology Albert brings to the table. Albert’s school, for example, is modeled after Jackson High School in Michigan – an older, gothic-looking building. My father spent time there as a principal, and later an administrator, so I’m pretty familiar with the building and some of it’s history. The CIA is similar in that it’s a very classic-looking building (even though it has that awesome modern wing), and I thought that would go well here. Hope you enjoy the page, and there’s more coming next week!